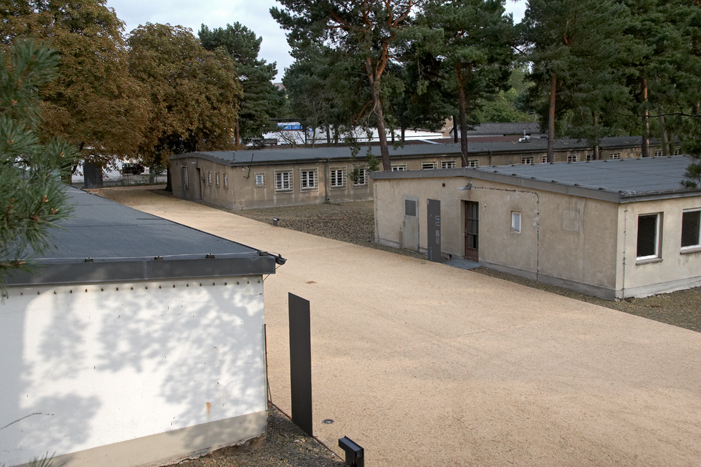 The camp in Schöneweide was built from the end of 1943 by the "General Building Inspector for the Imperial Capital" (GBI) under the direction of Albert Speer in the middle of a residential area. The 3.3 hectare area (equivalent to approx. 4.5 football fields) comprised a total of 13 accommodation barracks as well as an economic barrack in the middle. The camp was planned for 2,160 forced laborers. However, the camp was never fully occupied. More than 400 Italian forced laborers, including military internees, as well as civilian forced laborers from various countries were accommodated here. In the last months of the war in 1945, two barracks also served as shelters for female concentration camp prisoners who had to work at the Pertrix battery factory. After 1945, the Red Army first used several barracks as paper storage facilities for the Soviet military administration. Shortly after the war, the GDR Vaccine Institute moved into the six barracks that today belong to the Documentation Centre. The other barracks are still used today by a workshop, a sauna, a kindergarden, a car dealership and a bowling pub. After 1989 the vaccine institute was closed down, from 1995 this part of the historical camp site stood empty for more than ten years. In 2004, the Berlin Senate decided to establish a documentation centre on the history of Nazi forced labor here. With the support of the Foundation "Remembrance, Responsibility and Future", an International Founding Advisory Board was established in 2005/2006. It discussed the design and use of the historical site as well as the concept of the future documentation centre as an exhibition, archive and learning location. Two barracks were prepared for exhibitions, events, seminars, archives, library and offices. On 24 August 2006, the Documentation Centre was officially opened and handed over to the Topography of Terror Foundation. In the meantime, three more barracks have been renovated, one of which has served as an international youth meeting place since 2015. The creation of the Documentation Centre is due not least to the great civic commitment and the broad debate on the growing public debate on the compensation of former forced labourers.